New duds coming my way! Thank you, internet. Urban Outfitters was having a massive sale (every piece I got was under $15). 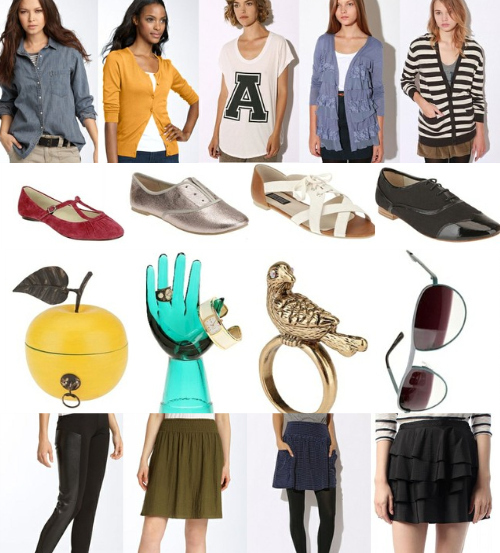 The chambray shirt, yellow cardigan, leggings, and green skirt are from Nordstrom, which is also doing a big sale. I am most excited about the shoes (all a size 10, now that I'm fairly certain I will never be a 9 again) and the leather paneled leggings. I really want to amp up my style. I was looking through my archives and realized that i have not had what I think is a great outfit in quite some time. Any suggestions on how to style the items I got? Y'all know that I LOVE shopping at thrift stores and estate sales, but when it comes to buying new clothes, I much prefer shopping online vs. shopping in stores. Most online retailers have excellent return policies, so I have no qualms about retuning things that just aren't up to snuff. What about you?